Most extravagant weddings have a groom’s cake and a bride’s cake. Well this couple decided to use their heads (ha, get it?!) to come up with this morbid and creepy idea for their wedding cakes. 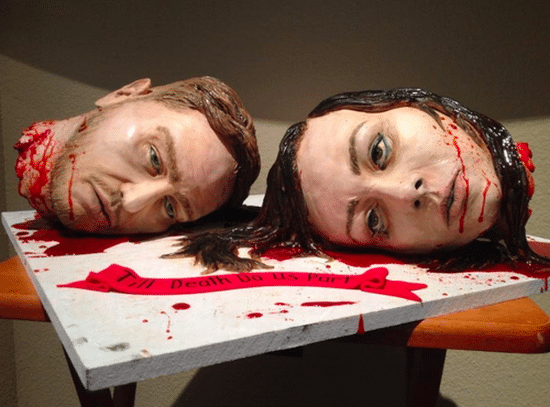 Since their wedding was based around their love of horror movies, they decided to use their decapitated heads with “til death to us part” as their ceremonial treats. We must admit, it’s pretty detailed and looks totally realistic! So this actually happened. 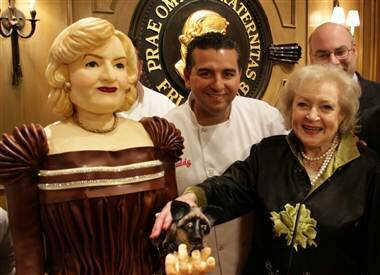 Betty White received a birthday cake in the shape and style of herself from the New Jersey folks and Buddy from the famous show, Cake Boss. Fun fact: Betty White is 92 years old! That’s 92 cakes. Incredible. This doesn’t sound appetizing but we can assure you that no sea creatures were involved in the creation of this cake. 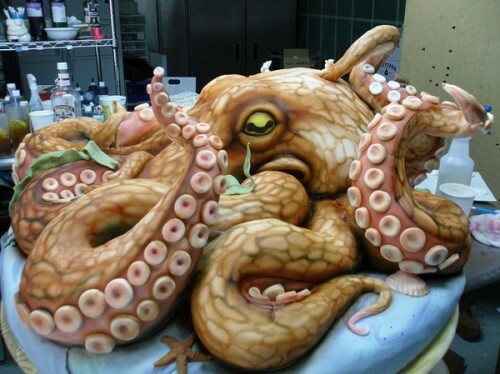 This octopus cake weighs an astounding 200 pounds and is incredibly lifelike. I wonder what kind of occasion this was made for?! 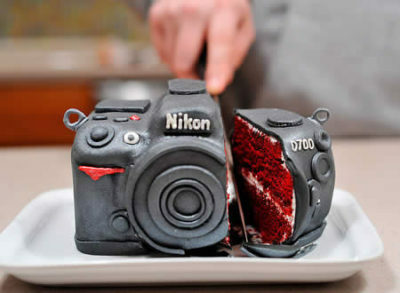 This Nikon camera cake looks almost too real to eat! This red velvet and vanilla frosting cake is not only creative in more ways than one, but it will win your heat – through your stomach. 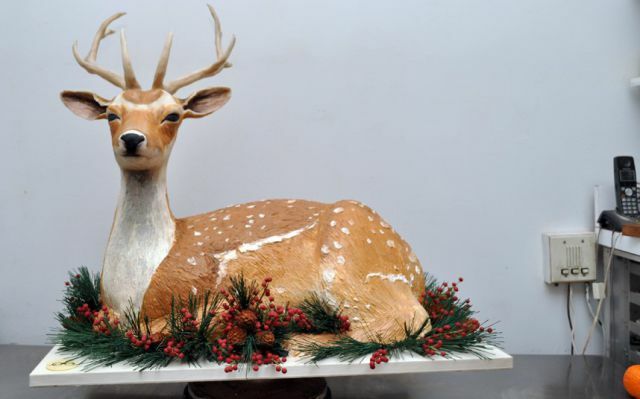 If you’re a nature lover and want to be amazed, check out this incredible deer cake. Featuring berries and bushel, this lifelike cake will not only scare your guests but it will serve a ton of people! No deer were harmed in the making or the consuming of this cake. This cake was an actual wedding cake for this woman and her husband. Not only did it NOT have her husband anywhere on it, but it’s the same height as herself, too! She looks smiley in the picture but her husband looks like he’s not prepared for what’s to come in their marriage. Speaking of weddings, this cake is a life size replica of a bride’s dress. Not only is the dress beautiful, but the detail on the actual cake (pictured above) is astounding! We wonder how much of the budget it ate up and if this was a mutual agreement between the couple. You may or may not mistake this next cake for a pillow and a crown, that’s how lifelike it is! This pink tufted crown pillow is adorned with tassels and buttons that are edible, of course! This is perfect for any little girls birthday or the average sassy adult! This cake will bring back memories of you playing Majora’s Mask in your bedroom with your friends. This cake features Link and Princess Zelda on a Nintendo 64. Other features include some characters you might see in the backgrounds of the game and a controller.